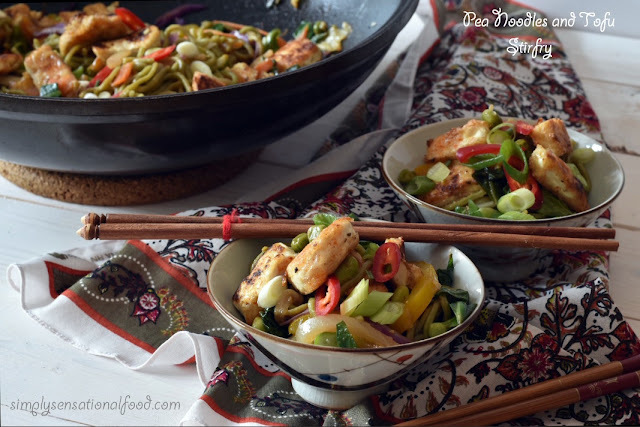 I love warm salads or stir fry's as they are easy to make and can be really satisfying. They are the perfect choice to cook after a hard day at work as very little preparation is required. I have recreated this Pea noddle and Tofu stir fry, using the ingredients from Marks and Spencer's who have recently launched their new vegan and vegetarian range. I had the opportunity to try this recipe at a recent launch hosted by Marks and Spencers for Veganuary. They were showcasing their new products and vegan wine. In the range they have many new stir fry sauces and prepacked vegetable packs, egg free noodles and gluten free options too. 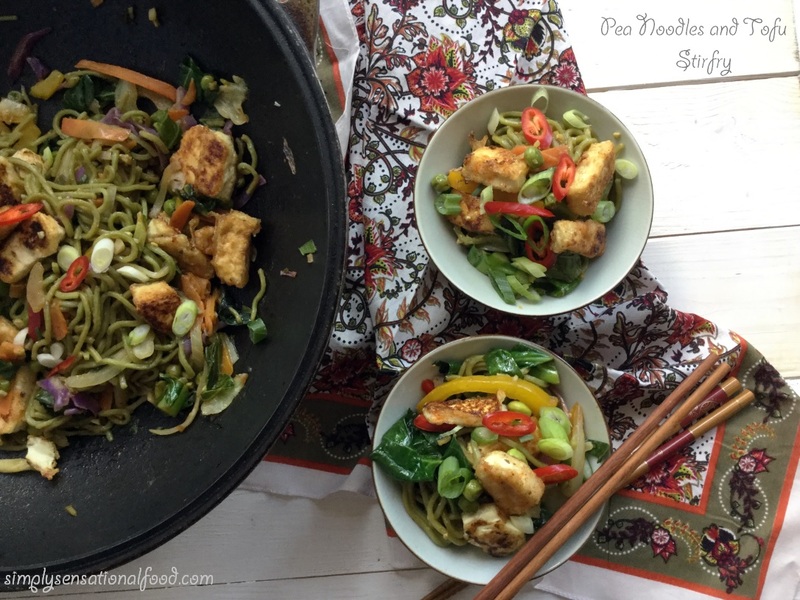 The noodles in the recipe are made with pea and lentils making them high in protein, together with the green edamame beans and stir fry vegetables and the tofu, this dish has the perfect balance of textures and flavours. I have adapted the recipe to my taste,the original recipe can be found here. 1. In a plate add the corn flour, salt and chilli powder and toss the tofu cubes in it and keep aside.2. In a frying pan add 1.5 tablespoons of olive oil and shallow fry the tofu in small batches until golden brown.Drain on kitchen paper.3. In a wok add the remaining olive oil and add the garlic and ginger followed by the edamame and pea stir fried vegetables toss over a high heat for 2-3 minutes.4. Add the noodles, soya sauce, lime and orange dressing and toss for a further 2-3 minutes until the noodles warm through. 5. Add the fried tofu and stir fry for a further 1-2 minutes.6. Transfer to a serving dish and garnish with the spring onions and sliced chillies. NB- To ensure that the tofu holds its shape, pat it dry with lots of kitchen paper to remove any excess liquid, dry and then cut it into cubes. This is very important to avoid it breaking when shallow frying. My fellow blogger friend Heidi also attended the launch with me to check her blog post about her experience. This sounds utterly delicious - i love substituting gluten heavy noodles for vegetable substitutes so may have to give these a go! The Pea noddles are really delicious nad were the perfect accompaniment. This sounds amazing, love the sound of the pea noodles too. I am definitely going to buy these again, I prefer them to the standard egg noodles. Oh wow this looks delicious! I love Peas and Tofu in a story fry and the Pea noddles sound ace as well. I do like to add as much veg as possible in astir fry and this Edamame and pea stir fry pack had everything in it. Yummy! I liked stir fry tofu, or fried tofu. I combined them with noodles too. This really is a healthy meal. It was one delicious and healthy meal,and I can see myself making this again soon. Your photos are great - really bringing out the food. Oh my I’ve never even thought of tofu as tasting nice before, but all of those flavours in one, the spice, the sweetness it sounds so so nice. Definitly going to give this a go. My goodness, I so much love this food combo..tofu with lots n lots of veggies tatstes so delicious, I feel like having this nutritional food daily. This looks really tasty! I really like tofu and to have it with pea noodles would be awesome! If I may make a suggestion to the recipe, I'd coat the tofu in hoisin sauce and then grill them before adding it to the noodles. Oh now this sounds like a delicious dish, I have to admit it has been a while since I made my own noodle dish and I definitely need to change that. We love tofu and pea noodle sounds like something we would give a go. I need to look out for this product next time we are at M&S. I absolutely love those pea noodles! That sauce sounds really yummy! I’ve only very recently discovered noodles and whilst I’m still adapting to the taste and texture I think I would give this recipe ago in the future. Oh this sounds delicious and just bursting with colour - and health! We are trying to eat healthier and this would be a great meal! OH WOW THIS LOOKS SO SUPER TASTY. I am experimenting with new meals as I'm losing weight and this looks healthy. I've never thought of tofu being appealing but all of these ingredients make make me try it out! This sounds so delicious!!! This looks perfectly delicious, and the kind of food I am so wanting at the moment. I really miss not having tofu reguarly, I really need to get back in to making it again. This looks so tasty! I really love the idea of the pea noodles so will look out for those. looks delicious and healthy! Over the years I have grown to love veggies more and more... I'lll have to try this recipe out this week! I love anything that has tofu, so I'm going to try making this at home. You had me at tofu!!! Interesting vegetarian dish with noodles. I reckon this is what I will be having on fridays since we are vegetarian on fridays. This recipe looks absolutely incredible! I am always trying to find new ways of incorporating tofu into my diet, it's such a versatile ingredient but sometimes I just lack inspiration so this post is just what I needed! I definitely agree that a stir fry is the perfect option when you want a quick bite at the end of a long day! Oh that looks delicious, I've never had much joy with tofu but this has inspired me to give it another go. I'm just bored with the plain old noodle love to have some color on that. Thanks for sharing this recipe surely try this and make my mum proud coz I learned a new thing to make. This looks so yummy! 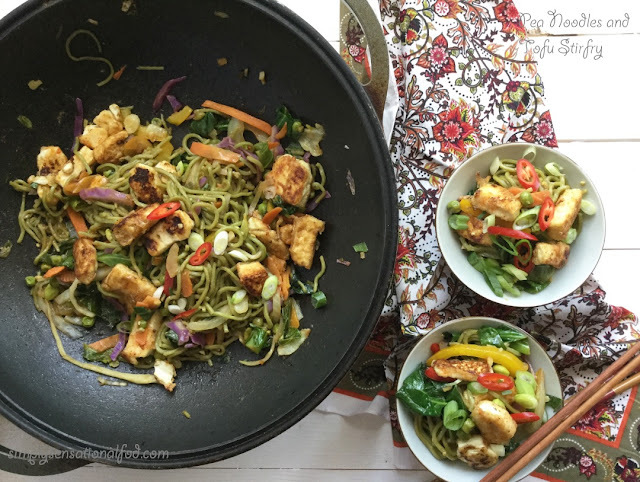 I love pasta but sometimes the noodles are too much for me, veggie noodles + tofu sounds like a fantastic solution. My fiance would love this too -- bookmarked! Great tip to pat the tofu dry to keep its shape. I love the natural colours that you can achieve with a stir fry. Healthy & beautiful! Tofu!Yeey! I once had a tofu stir fry bite in one of the 5-star hotels here in Kenya and I loved it...I mean..it's kinda rare here...anyway, I can imagine how this delicious meal you got us here is! The pictures are too lovely! So yummy! Oh yummy I love anything and everything with tofu so I would totally love these. I never heard of pea noodles before though, need to try making this. I actually had no idea that M&S had a vegan range but I applaud them for supporting Veganuary and I am especially inspired by your tofu stir fry. I am very particular about how I like my Tofu as it can get rubbery, I like it nice and crispy like in a context of a stirfry like you have created it here. And I love the addition of the pea noodles as well that is so innovative! This looks delicious, I'd love to make this for a mid week meal! the photos make this dish look even better! I love how they make different food products out of peas. I love pea snacks but I haven't tried pea noodles yet. I will have to try this recipe. I’ve never tried pea noodles and these sound absolutely amazing! 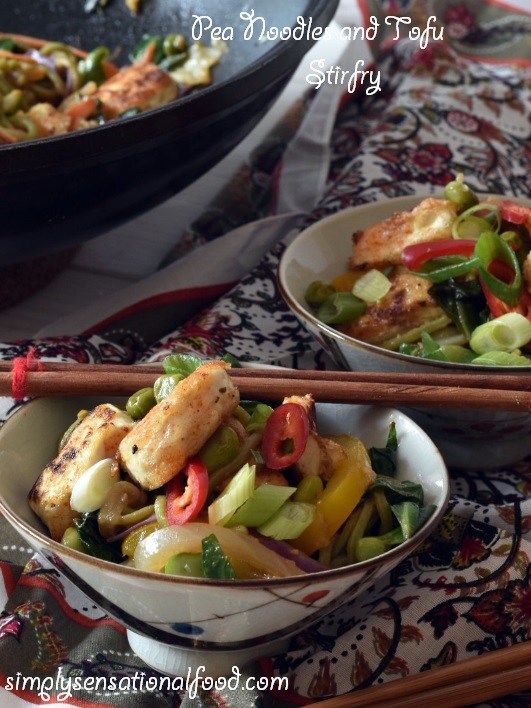 I always like to try different stir fry recipes so will definitely be trying this out next week! I’ve never ever thought of pea noodles! They sound amazing! This looks delicious. I love new dishes and can't wait to try. I always look out for a ingredients or recipes which are high in protein and I am so glad to find your recipe, sounds delicious and healthy. This is such a healthy meal served beautifully. I like the idea of pea noodles. What a lovely dish . so healthy. Must look for these noodles but I don't think I will be able to get them here. Colourful and crunchy veggies make it all the more attractive and inviting. Absolutely flavoursome dish and the only way i can eat noodles is when I have loads of veggies in it. This is just what I would love. Quickly done, loads of flavours, veggies and not to forget the yum taste and protein factor in the form of tofu or paneer in my case. A must try! Veganuary - Zizzi Pizza Restaurant.